The Wisconsin Spring Spin In sprung and it was a splash. But alas, we never saw the hotel's indoor water park. We were there to rep and sell for Interlacements Yarns. This show was a nice change of pace from the mega Stitches experience in California. 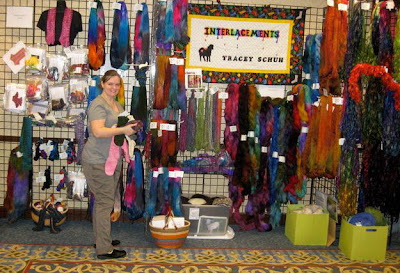 Tracey (the boss), Zoe (the designer) and I made lots of fiber friends and enjoyed steady sales. The days were still long and all we wanted at the end was food and bed. 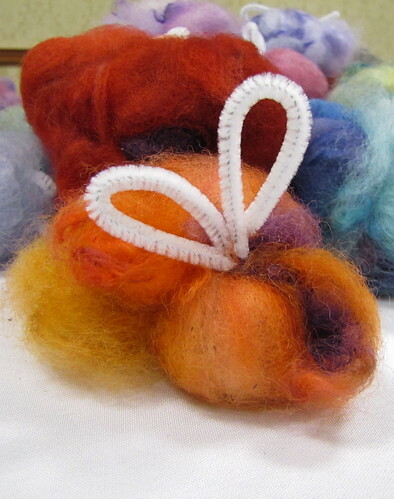 ... And maybe a felted soap lesson. 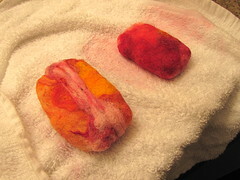 Felting wool over hotel soap for a little late-night project. 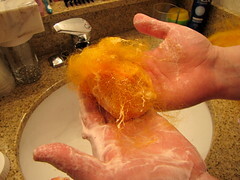 It's like always having a sudsy washcloth! We got tips from Tracey and followed these directions. This show was extra special for me because the company launched my first loom-knit pattern. The Bunny Baby hat and its Cotton Candy yarn got their own little loom corner. I believe we sold 4 or 5 patterns, which was pretty awesome for a small show. 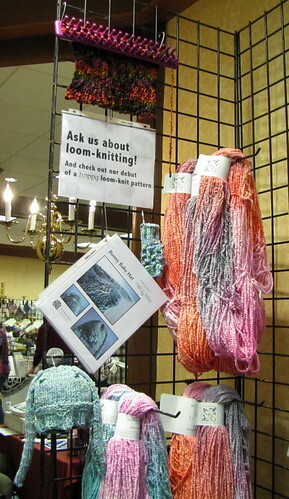 I showed off some board knitting with Mikado wool yarn, too. 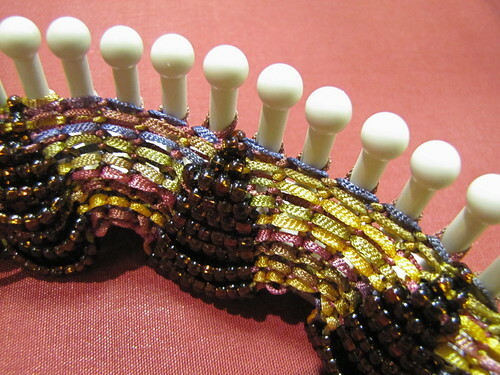 During the downtimes, I picked up an Interlacements pattern for the Beaded Scarf and translated it to the loom. I showed this off and some other simple stitches to our customers. Some visitors wanted to buy a loom, too, which unfortunately we don't sell. But we might have a solution for future shows. 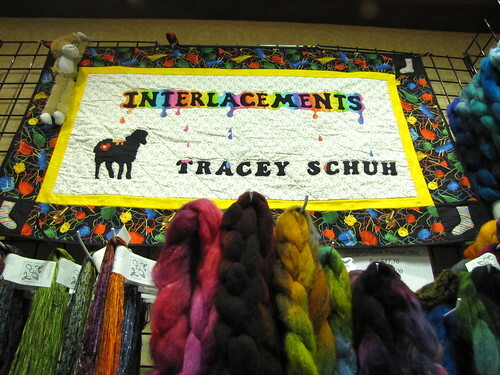 One of our booth neighbors — Hillcreek Fiber Studio — goes to many of the same regional shows as Interlacements. 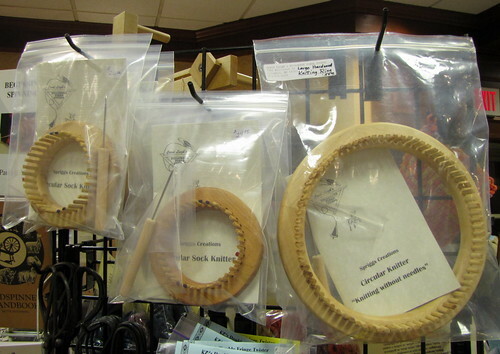 They sell the hand-crafted Circular Sock Knitter by Spriggs Creations ... and a few other sizes, too. The worsted-gauge looms have nice smooth wooden base that I would compare to last year's Decor Accents looms. The pegs themselves are wooden and are a bit rougher. I won't be sure if this will be an issue until I start knitting with them. Soon enough, I will be designing some worsted socks for these babies and hopefully selling them at Interlacements! Then we can refer our customers to a local vendor for their loomy desires. 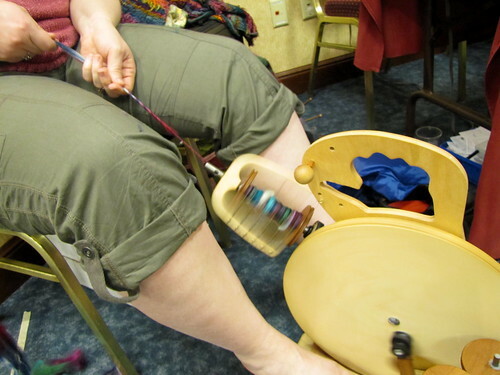 Zoe of Knits by Zoe tries her foot at spinning in the booth. 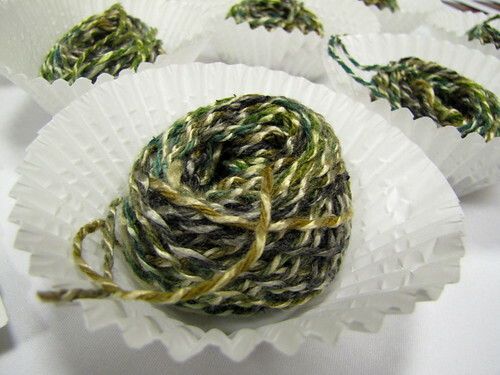 Interlacements hosts a Yarn & Fiber Tasting night.